Snap has had a rough year. Its stock price is cratering, and its once hype-worthy new product, Spectacles, has left the the company with almost $40 million of unsold inventory. But even with all that, the thing people will probably remember the most about Snapchat in 2017 was that stupid dancing hot dog. 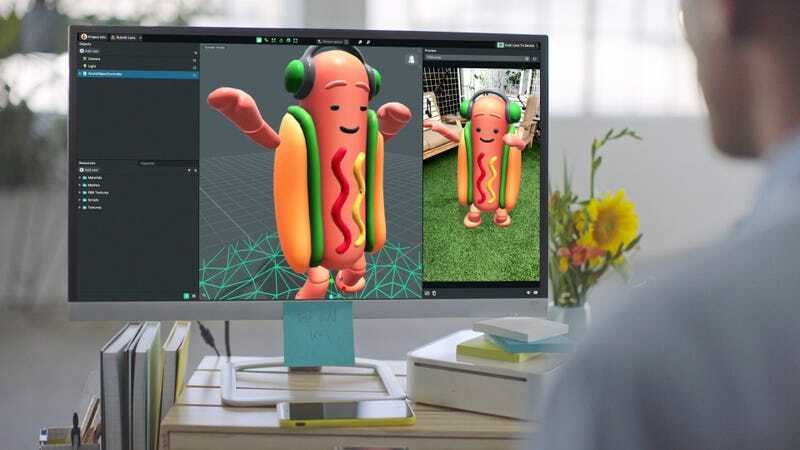 So now, in order to help reverse the company’s woes, Snap is releasing Lens Studio, a new Windows and macOS desktop app that is designed to help individuals create new augmented reality Snapchat lenses. This is the first time users have been given the tools to create their own AR experiences in Snapchat, and should open up the platform to all sort of hilarious memes and jokes. Users will be able to create both 2D and 3D objects that can be placed and moved around anytime your using your phone’s rear camera. Sharing new lenses with friends is also quite simple, since all you need is a unique Snapcode or a custom link generated within Lens Studio. The one thing to note is that while Lens Studio may have been created to help democratize the lens making process, the software will probably be a much bigger boon to advertisers than the average joe. For interested parties, Snap has partnered with several AR development agencies that will help businesses create custom lenses than can be used with both the front and rear-facing cameras. So prepare your eyeballs, because now it’s time to see how many wriggling AR memes with little Gatorade logos or BMW badges it’ll take to right Snap’s sinking ship.